Enhance your Bible study with this elegant, limited edition of the Little Rock Catholic Study Bible with a beautiful embossed, brown, leather-like cover. Gold, gilt-edged pages, ribbon markers, plus a presentation page and three family tree pages also make it a perfect family Bible or gift. 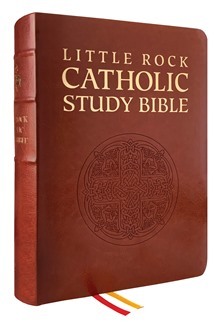 With its readable translation, lucid introductory essays, informative notes, and rich commentaries, Little Rock Catholic Study Bible is now easily the best didactic tool for Catholics to learn about the Bible not only as a historical and literary document but also as the inspired Word of God. A fruit of many years of collaborative work by eminent biblical scholars, this Bible is now placed in the hands of Christians, Catholics, and non-Catholics alike, so that their minds and hearts may be formed and nurtured by the ways God has spoken and acted in history. Thanks to their monumental labor the renewal of the church as envisaged by Vatican II, especially in its dogmatic constitution on Divine Revelation, will be brought a step closer to fulfillment. Most Bibles contain footnotes and cross references, as well as introductory essays that introduce the respective biblical book. Some versions are called 'Study Bibles' and include lengthy essays in the front of the volume. While The Little Rock Catholic Study Bible contains customary introductory information written by several well-known scripture scholars, it has placed explicit study information on the page where the specific reference is found. Such study material includes definitions of terms and ideas, information about various characters, archaeological findings, relevant Church teachings, and links with liturgical celebration. Pictures, charts, and related lists are also strategically placed throughout. All one needs for the initial study of the Bible is found within the pages of this remarkable volume. A prophet proclaimed, 'When I found your words I devoured them; they became my joy and the happiness of my heart' (Jeremiah 15:16). What a wonderful gift the Little Rock Catholic Study Bible is for the People of God, especially those who hunger for God but are puzzled or intimidated by God's Word. Clear background information, explanations, and charts throughout its pages help make the Word of God palatable for modern readers. In addition, pictures of the holy sites, like seasoning, make Scripture more appealing; and prayer starters encourage savoring it. By feasting at the table of the Word as presented in this study Bible, readers will be drawn to Jesus, who is the ultimate Word and source of eternal joy. The Little Rock Catholic Study Bible offers first rate scholarship and pastoral sensitivity in bringing the word of God to all who desire to deepen their understanding of its message as a living word that fosters faith in its readers. As a coordinator of the Los Angeles Archdiocese Catholic Biblical Institute, I am always searching for resources that will enhance the lectures and required reading of our students. The Little Rock Catholic Study Bible lives up to its claim as an 'all-in-one-resource.' Significant church documents on the Bible, as well as the church's use of the Bible in liturgy and social justice, help guide the reader to a Catholic approach to reading Scripture. Introductory notes on each book of the Bible, indexes, extensive footnotes, cross references, clarification of difficult terms and ideas, color maps, time-lines, charts and photographs, together with prayer starters, provide everything necessary for a successful encounter with God's Word. The Little Rock Catholic Study Bible provides readers with just the right amount of background information needed to read the Bible with insight and understanding. Presented in an attractive format, it relates Scripture to liturgy, and it shows how a prayerful reading of the Biblical text leads to a more mature spiritual life. This is an outstandingly helpful resource. It offers both a window and a mirror into Sacred Scripture. It draws us in, speaks to our hearts, and compels us to act as disciples. A must for all groups that gather around Scripture.